Ugetsu, directed by master filmmaker Kenji Mizoguchi, is a beautiful supernatural tale set in 16th century Kyoto and Shiga prefecture. The films screenwriters Matsutaro Kawaguchi and Yoshikata Yoda wove together two stories from Akinari Uede‘s best-known work, Ugetsu Monogatari (Tales of Moonlight and Rain, 1776) and French writer Guy de Maupassant‘s Decore! , 1883. The two stories from Ugetsu Monogatari, The House in the Thicket and The Lust of the White Serpent (Asaji ga Yado and Jasei no In) are part of a collection of supernatural tales, which are largely taken from traditional Japanese and Chinese ghost stories. By the time he made Ugetsu, Kenji Mizoguchi was already an elder statesman of Japanese cinema, fiercely revered by Akira Kurosawa and other directors of a younger generation. And with this exquisite ghost story, a fatalistic wartime tragedy, he created a touchstone of his art, his long takes and sweeping camera guiding the viewer through a delirious narrative about two villagers whose pursuit of fame and fortune leads them far astray from their loyal wives. 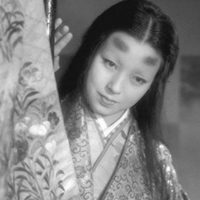 Moving between the terrestrial and the otherworldly, Ugetsu reveals essential truths about the ravages of war, the plight of women, and the pride of men. The film stars Machiko Kyō, Mitsuko Mito, Kinuyo Tanaka, Masayuki Mori, and Ei Ozawa. The film won the Silver Lion at the Venice International Film Festival and was nominated an Academy Award for for best costume.